Inside Out Architecturals, Utah’s premier decorative tile showroom, is now offering Anoma Stone Signature Dimensional Surfaces. “We are excited to introduce the western United States to a new level in architectural detailing. Anoma has successfully embraced technology with craftsmanship in creating larger-scale carved-stone detail that has been embraced by India, China, and other countries for over 20 years,” says Leah Wynn, owner/operator of Inside Out Architecturals. “We believe that the U.S. market and its professionals are ready to play with these intriguing designs and creatively use them to their full potential.” Customers of Inside Out Architecturals will be able to special order any of the Anoma signature styles, which are customizable. 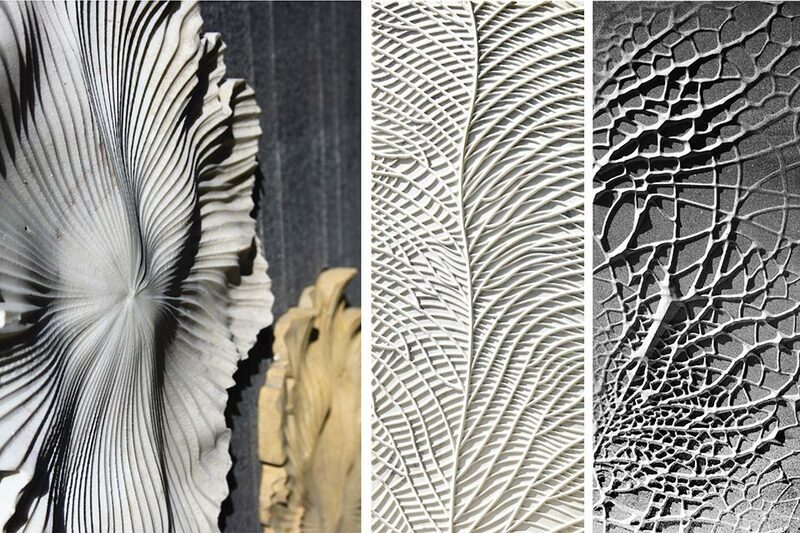 Drawing inspiration from the subtle patterns of veins on leaves, the Foliage evokes the beauty of natural textures. That beauty is embodied and highlighted in both wall textures and sculptures. Available in 24” x 24″. 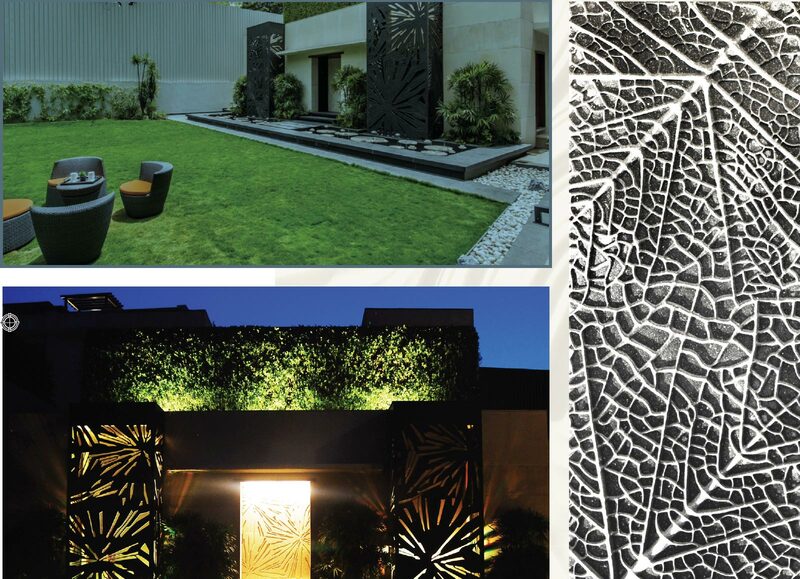 These back-lit panels explore the possibilities of natural shape. 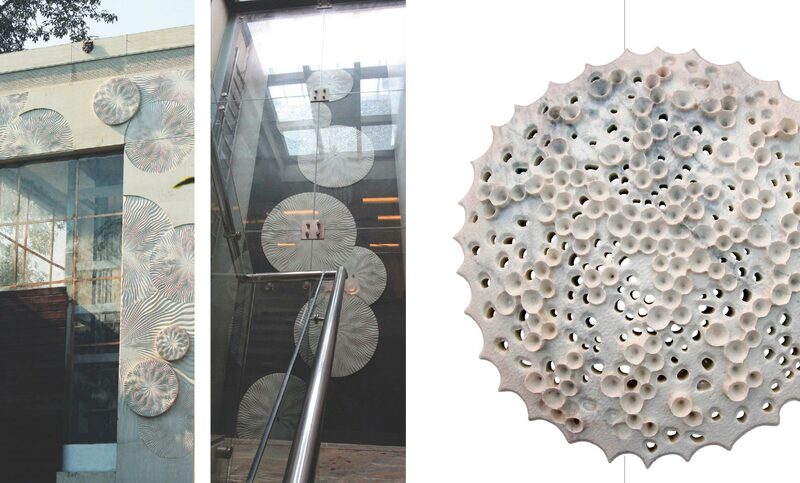 Using Xylem-Lalwani-30mm graphite grey granite, these 5-meter tall installations mirror the depth of a lotus vein. Representing over 50 unique decorative tile lines, Inside Out Architecturals has a collection of the most intriguing tile options, ranging from unique wood parquet and large-format glass to the greatest of traditional flooring and historical ornamentals consistently used for their charm throughout the years. Additionally, Inside Out carries the handiwork of today’s finest artisans in metal, glass, and dimensional tile that are best described as “art” now, including Anoma Stone. One visit to Inside Out’s showroom will open your eyes to the possibilities. With over 40 years of combined experience in assisting both design professionals and homeowners, the energetic and knowledgeable staff provides each client with the details that will make their project sing. The tile industry has experienced substantial growth in the last ten years, and Inside Out prides itself on knowing how to ask the right questions to assist its clients in discovering what their needs and wants are and helping them create the tile layout design that will give them what they are looking for. Inside Out Architecturals is a playground where creativity with tile can run wild. Visit the showroom and realize the full artistic possibilities of your project. Share the synergy of those who love what they do and are excited for the unique opportunities that each project provides. Inspired by the Japanese paper folding art of Origami, the Puristu-Puristu pieces come in several sizes, colors, and thicknesses to evoke the dramatic pleats and creases of multi-dimensional form. Part of the Ishi-Kiri collection, these surfaces have versatility in shape and installation, and have marble faces that can be lit from the front or back for a striking, yet calming aesthetic. The Anemone evokes the sea species for which it is named. Craftsmanship and innovation sculpt the piece, which is available in several stone colors and sizes. Large-format tiles are constantly evolving. 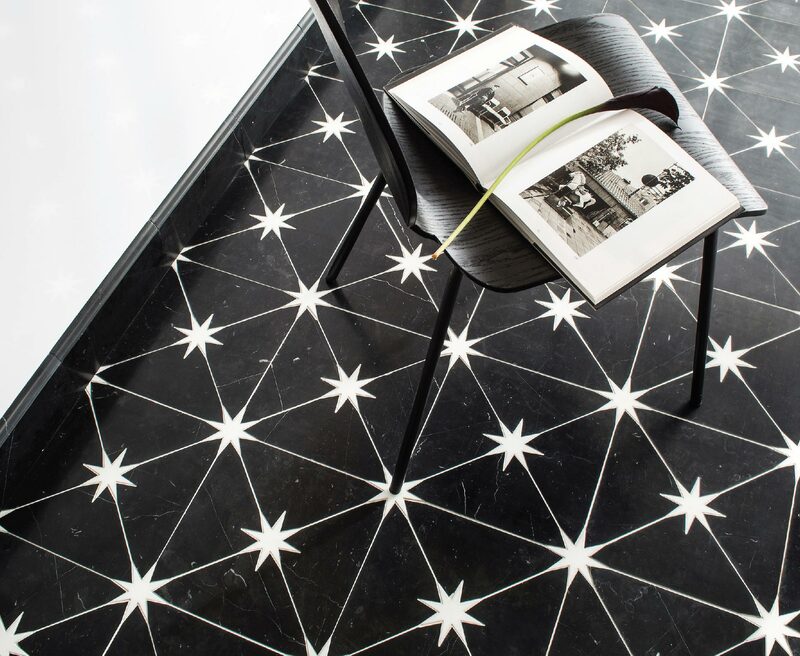 When it comes to today’s residential and commercial applications, larger tile sizes are all the rage—making for unique stylish designs. We are seeing opportunities for tile ‘feature walls’ and a lot of great dimensional tile options for that application. Large-format tiles have gone beyond 12×24 inches. We are seeing 40×120 inches, and in some cases, even larger. Outdoor porcelain pavers are becoming quite the trend, especially in mountain regions. Porcelain pavers are frost-resistant, skid-resistant, durable, and easy to clean. Pavers offer a range of patterns, textures, and larger sizes for your driveway, walkway, patio, and more. 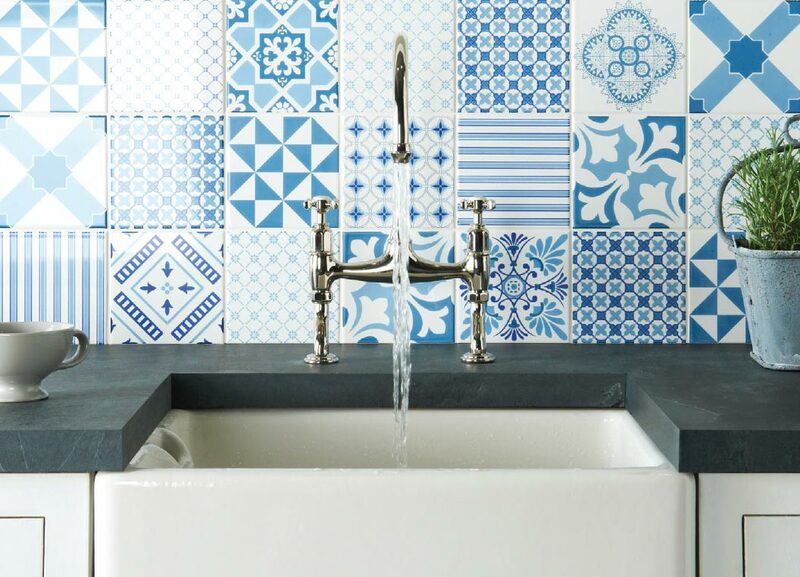 Wouldn’t it be nice to have your whole palette picked out for you, including paint and grout? Well, look no further! Companies have been successful in creating package deals for their clients. These include wall and flooring materials, paint and grout to match, and even a decorative tile to give you a little “bling,” all in one. These palettes are enriched with vibrant colors and oversized formats devised to meet the continuing needs of design and complete your look in one simple step. Remember how this year was the “year of the hex?” Well, now we are cutting those hexes into triangles! Much as the same way lines have meaning, shapes have meaning too. Shapes have an endless variety of characteristics, each communicating different messages to your audience. So next time you think “hex,” think outside the “box” and try a triangle!